New Membership Sites For Sale/Rent! Custom Membership Sites & Pre-Built Ad Exchanges, Ad Boards, Link Cloaker Sites + More! This traffic site is using the NEW Ad Exchange Script 3.5. Finally, your chance to have a lasting online business! A great domain name 100% complete with a profitable sales funnel, auto-responder tool, built in affiliate program with x12 promo banners, promo text ads, splash pages plus a ton of other cool features that both you and your members will love! 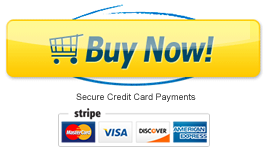 PAYMENT TERMS: One $349 payment today and you own the site + bonuses. This is the best option in the long run! PAYMENT TERMS: One $149 payment today then x5 $49 monthly payments then you own the site + bonuses! *You own once paid in full. PAYMENT TERMS: One $69 payment today then $19 monthly. *Domain & hosting is included free, you do not own the site. Built-in affiliate program with x12 banners and other resources for affiliates to promote your site with! Sites are 99% complete & ready to launch. Setup your payment details then start promoting! Get some great bonuses with your new site including free hosting, graphics + more! NEW! Option of changing the site background color and text of the site slogan. Domain will be renewed for another year on top of the current registration time. No hassles 6 months FREE hosting account with cPanel. Transfer or continue with low prices. Facebook Page graphics to match your new site. Includes cover and profile graphics. MembershipSiteSupport.com access for setup help, tips and resources to make your site a success! Get an awesome high quality 3D membership card for your site in 4 different sizes. Support from Phil to answer your questions & get everything running smoothly. This traffic site is using the latest version of the Ad Exchange Script. It has a great domain name – 100% complete with admin area, members area, graphics, offer pages plus all the great features of the Ad Exchange Script! Domain: AdExchangeWealth.com – Transferred into your name or to your domain registrar for full ownership. Functionality: 100% Complete with all features, graphics, content and offers.. ready for you to launch! 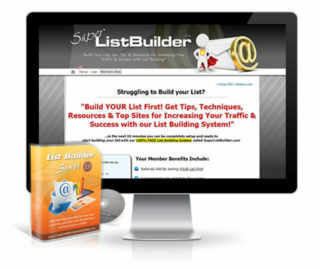 Build A List: Membership sites are like building a list. You will have a list of members to send promo emails to. Set the Autoresponder to send a series of emails automatically. Affiliates: All members are instant affiliates with their unique referral link, x12 banners in all the standard sizes plus pre-written text ads, splash pages plus more! Profitable: Very profitable and great converting One Time Offers, Downsells, Login Offers and Level Upgrades. There are 9 offer pages in total in the Ad Exchange. Admin Advertising: Add your own favorite affiliate links all throughout the site, 468×60 banners, 125×125 banners, login ads, logout ads plus more spots. Hosting: This site is currently on its own hosting account which you can simply take ownership of yourself if you have one of our Hosting Accounts. Or, this site can be transferred to your current hosting service provider. Our hosting is recommended to ensure your site runs smoothly. Support: Get access to Membership Site Success, a membership training area for admins only. You can also email Phil directly for support. Ready to get started? Order this site now to get Admin access. AdExchangeScript Version 3.0 AVAILABLE NOW! the experience and functionality for both Admin and Members! 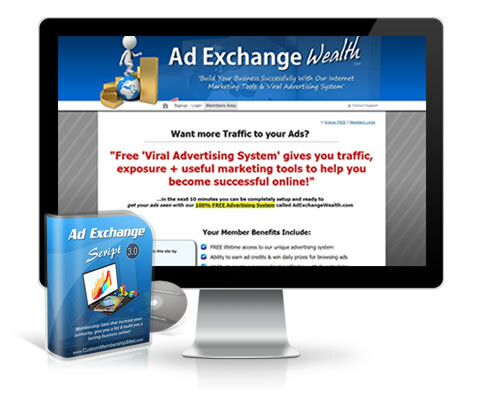 See what others are saying..
Would you love to start your own Traffic Ad Exchange Script Membership Site..
but not knowing where to start holds you back? If so, then I know exactly where you’re coming from. There’s nothing more frustrating than buying some old script full of bugs, trying to install it yourself, having to find a coder, then getting someone else to do graphics and finally someone who can edit html content. And to make matters even worse you need other companies for domain names and hosting accounts. You end up feeling frustrated because you’re trying to figure out everything on your own and nothing you do seems to get you to that next level. Until now the only way to create an Ad Exchange Membership Site would be to hire a very talented PHP coder, graphic designer, an html editor and probably an internet marketer to create a successful system. However the big problem with all of these options is that they are ridiculously expensive. For a start, a coder could take months to code and create the types of features needed. However, today I’m delighted to share with you my brand new Ad Exchange Script that is capable of building you a list, increasing your authority and making you a passive income online from the comfort of you home! I know that may sound unbelievable, but in a moment you’ll see how it all works, so just keep reading. My name is Phil and since 2008, I have helped hundreds of internet marketers and entrepreneurs just like you break free from the grind of creating a profitable online business, and finally achieving success. The original AdExchangeScript.com by Frank Salinas has now been bought by Phil @ CustomMembershipSites.com. This new version of the script available has had over 4 years of updates, bug fixes and newer mods similar to whats on my site AdExchangeBusiness.com. Whether you’re trying to build a list, make money online or business a lasting business, then this Ad Exchange Script is the missing piece of the puzzle you need to finally make your dreams a reality. If you’re sick and tired of promoting other peoples products, or trying business models that always end up failing, then you’re going to love owning a Membership Site. How does owning an Ad Exchange make money? Members signup free to use the tools on the membership site e.g. posting free ads to get traffic, referrals, cloak links or build their downlines. They are then taken through the special built in sales funnel that these scripts have. Free members have the chance to upgrade their accounts to a higher level that comes with premium advertising that is shown through-out the site. You receive the payments for these ads and upgrades. Why do I need an Ad Exchange Script Membership Site? Membership sites are one of the best business models online! Membership sites are sticky, meaning that your visitors and members will return often and use your site. They will be actively logging into, sometimes multiple times a day to use your tools, learn more, build their down lines, earn commissions plus a whole range of other great reasons why they will return. Email your membership database – All members will be on your database list so you can email them with news and updates regarding you site, new offers, free promo codes, new sites features.. You get the idea. The possibilities are endless, and all these are legit reasons to email your members. They will love to hear from you when they know they might be getting a free promo code from you, or some latest news, or product you are promoting. It’s a great way to promote your favourite programs in one place – If you are like me and have a million things on the go, tons of things to promote and not enough time, then having a membership site is a great place to promote everything in one place. There are spots all over the site where banners can be added. On the front page, login page, as a member logs in, the members area, under the navigation in members area, the site footer, logout pages plus a whole lot more spots! There are old versions online being sold by people that shouldn’t be selling it, and are selling it cheap. When you purchase my Ad Exchange Script you can be assured this is the best version out there with a ton of cooler mods added like an HTML editor for admin, Auto-referrals for upgraded members, 6th Level VIP Founding Membership, Autoresponder for members plus a ton more updates that make this script the best out there! Ad Exchange Script Requirements – cPanel Access, PHP enabled, ability to setup cron jobs, minisite graphics template and banners for affiliates to use. With so many amazing features, incredible results, and glowing reviews, you’re probably eager to know how much it’ll cost to get your own Ad Exchange Membership Site. And that’s understandable given that most people (on average) spend thousands to get a fraction of what you’re receiving today. And so if you act now by clicking the Order Now button, you can have your own Ad Exchange Site.. So here’s your chance for success. Just click the “Order Now” button at the top of this page. You’ll be glad to know that the Ad Exchange Script comes with my personal 100% Rock Solid, money back guarantee. If you don’t LOVE your site, for whatever reason, then I actually don’t want to keep your money. All you have to do is shoot me a quick email within a week and I’ll immediately refund every cent. Look, you can’t afford to keep going the way you have been for another year. Owning an Ad Exchange will open up a whole new world of fun and adventure for you. Imagine what it will feel like to finally be recognised online, finally build a list, and finally build a lasting business online. So grab your copy of the Ad Exchange Script now or a custom designed site and let’s get you started today. A ‘Script’ is the code, files and database that makes your membership site work. It includes an Admin Control Panel, Members Area and all the necessary files and coding to automate features of the sites. These scripts are created using PHP. Under the ‘Edit Pages’ section, Admin can add html that updates certain parts of your site e.g. offer pages, members area, front page, login ads etc.. There a tons of areas to edit, making these scripts very easy to customize! NOTE: If I setup the site for you, you don’t need to know any technical knowledge at all, these sites are easy to operate and take little time! Read customer Testimonials happy membership site owners. 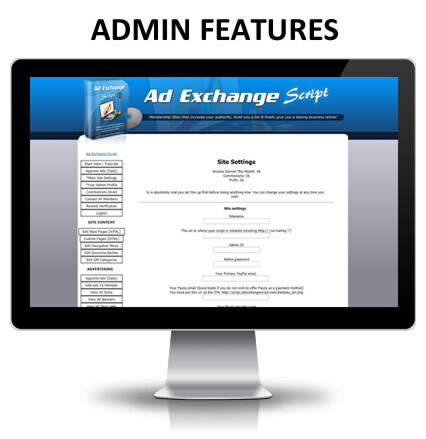 Below shows you each page and section in the Admin Area of the Ad Exchange Script. Start Here / Tutorials – Admins have access to the video tutorial links for the ad exchange script. Admin Profile – Admin can upload a photo, add name, address, email and user id. Shows your photo on front page and other places on site. CAN SPAM compliant setup in the admin panel which automatically embeds admins physical address and website name as well as the instant account deletion link in every email! Commissions Owed – Shows what members are owed commissions after now and who have waited the 3 days for commissions to be ready. Commissions can be downloaded into a text file so that admin can instantly pay commissions! Resend Verification – This sends the verification email to all members to haven’t yet verified their account. Script Automatically deletes all unverified accounts after 24 hrs! Logout – Admin can log out of their account. Edit Pages [HTML] – This is where you can add and edit the html content for your site. The front pages, offer pages, members area pages etc. NEW Built in HTML Editor allowing admin to edit the content on all pages easily! Custom Pages [HTML] – Create new pages that automatically get added to the menu system for members to see. Edit Navigation Menu – Create new menu items for members, re-order them or activate for certain membership levels only. 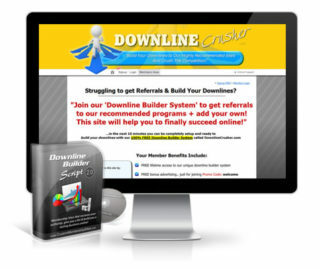 Referral Builder – Admin can add unlimited sites to their downline builder. Members will join under each other helping everyone build downlines and signups. Gift Categories – Create and edit the categories for the gift slots for upgraded members. Approve Ads [Daily] – This is where the admin needs to login and come to every day to check and approve ads. Don’t approve ads with broken links or wrong banner sizes etc. Add Ads To Member – Admin can manually add banners, login ads or any other type of ad to any members account. As the admin, give your own members account a ton of ads to get your site started. View All Solos – View the solo ads in the system that members have submitted. View All Banners – View the solo ads in the system that members have submitted. View All Text Links – View the text ads in the system that members have submitted. View All Login Ads – View the login ads in the system that members have submitted. View All Gifts – View the gifts in the system that members have submitted. 468×60 Banners – Admin can add their favorite 468×60 banners to get shown randomly with other members banners. 125×125 Banners – Admin can add their favorite 125×125 banners to get shown randomly with other members banners. Recommended Links – Admin can add their favorite text links that get shown when the very bottom link ‘Recommended Site of The Day’ is clicked. Contact All Members – Ability for admin to email all members, just Free members, any level upgraded member, or only members that joined after a certain date! Autoresponder Tool – Admin can setup automated emails with the build in autoresponder tool. Set the level of membership for each email or send to all. Set the days apart that each email is sent. Mail Settings – Displays the settings for the mailing system. It can be left as it is and will work fine. View Members – Admin can view a complete list of all members on the site. Shows username, email address and who their referrer was. Ability for admin to login as any member by clicking on a member name. Search Members – Search for a member by using a username, email address, or name. Upgrade Member – Admin can manually upgrade members to any level. Add Promo Banners – Admin can add new promo banners for affiliates to use. Adding here will automatically add them to the members area, ready for affiliates to use with their referral URL built in. Add Promo Emails – Admin can add new promo email ads for affiliates to use. They will show in the Tools & Stats or affiliate tools page automatically. Viral Thank You Ads – Admin can add new text to create Viral Thank You Ads that affiliates can use. Promo Text – Admin can add new small promo text snippets that affiliates can use. Promo Tweets – Admin can add new text for Tweets that affiliates can use. Splash Pages – Admin can add new splash pages that affiliates can use. OTO Settings – This is where you edit the settings for the One Time Offer. Change the price, advertising amounts and account level upgrade that members will receive after purchasing. Special Offer – Change the settings for the special offer page that members will see. Very Special Offer – Change the settings for the very special offer page. Last Offer – Change the settings for the last offer page. Last Offer 2 – Change the settings for the last offer 2 page. 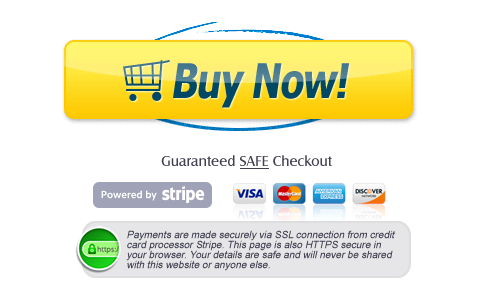 Offer Page – Change the settings for the offer page. This page can be used for new offers that members will see after logging into their account. Offer Page 2 – Change the settings for the offer 2 page. Use for special upgraded accounts or special ad packages that members can buy. ThankYouALot – Change the settings for the ThankYouALot page. This gets shown after members buy something, they’ll see this special offer page. ThankYouALot Final – A second chance at getting the thank you page offer. Change the settings to reflect your offer here. Edit Promo Codes – Add and edit promo codes for members. Edit the total amount of redeems for each code and add the advertising or account upgrade for each code. Edit Prizes – Edit the prizes that members get when completing a prize reward level. Prize Settings – Edit the prize settings for the click bonuses. Prize Winners – Shows the members who have won prizes. Top Affiliates – Shows the top affiliates. The members who have referred the most signups. Top Referring URLs – Shows the top referring URLs. The web address that has brought the most signups to your site. Top Signups – Shows a list of days and how many signups were on that day. Top Logins – Shows a list of days and how many logins were made on that day. Referrals By Date – Shows a list of referrals and sales for every day. Sales Statistics – Shows the statistics of all the offer pages on your site. Displays the amount of signup against sales and gives you a percentage. Banned Emails – Admin can add a list of banned emails that will be denied access to the site. List of features and tools that members will have access to with the Ad Exchange Script. Free Membership – Members can signup free and have the chance to upgrade their accounts to higher levels or buy advertising. Free Promo Codes – Members receive a free welcome promo code giving them free ads. This gets members excited and signing up to the site. Ad Credit System – Members receive points for clicking on banners, traffic links, solo ads credit links and text ads. Surf Pages to Earn Credits – Members can surf full page ads to earn credits. Trade Commissions – Members can instantly trade their commissions for points. Instant Commissions – Members can earn instant commissions if admin has this option on. Trade Points for Ads – Members can instantly trade their points for advertising. Earn Credits Code – Members can get html code to place on their sites to show banners, earn credits and get referrals. Earn Credit Prizes – Members can click a certain amount of ads every day to be in to win ad prize packages. Easy To Promote – Members have instant promotional emails, banners, tweets plus more tools to easily promote your site. Instant Affiliates – Members are instant affiliates with a unique URL and can earn commissions for promoting and getting sales. Cut & Paste Tools – Affiliates get easy to use cut and paste code for the promo banners and emails. Banner Preview – Members can preview banners when they set them up. Save Ads – Members can save their ads, which enables them to setup easily next time. 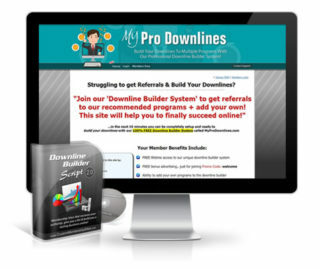 Downline Builder – Members can signup and add their URLs to the Downline builder. Automatic Upgrades – Members are upgraded automatically and advertising is added automatically. One Account Only – The script only allows 1 unique IP address to signup – preventing fraudulent signups. Auto Account Deletion – All emails contain an instant account deletion link! This will save you and your members time if anyone wants to delete their account. Forgot Password – Forgot password feature on member login page. Vacation Settings – Vacation setting in members area for members to stop receiving solo ads until they come back off of vacation. User must wait 1 day after coming back from vacation before being able to advertise to prevent cheating of the site. Verified Accounts Only – Members cannot use website until they have verified their account. *Your privacy is respected, ​easily unsubscribe anytime. Test Drive The Scripts FREE! NEW! Join my Newsletter to stay informed, get login access to 'Membership Site Demos' to Test Drive the Member & Admin Areas of the Scripts, grab the eBook on finding great domains PLUS get bonus advertising on my sites all FREE! 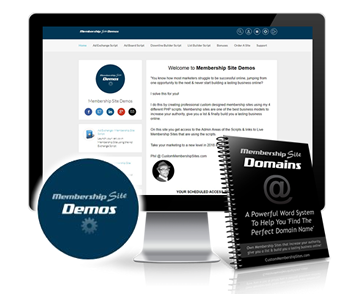 Join my Newsletter to stay informed, get login access to 'Membership Site Demos' to Test Drive the Member & Admin Areas of the Scripts, grab the eBook on finding great domains PLUS get bonus advertising on my sites all 100% FREE! *Your privacy is respected, unsubscribe anytime.